JPMorgan's board of directors, which CEO Jamie Dimon chairs, recommends that shareholders vote against a proposal that calls for avoiding investments in companies that contribute to genocide, including PetroChina. NEW YORK (CNNMoney) -- For the second year in a row, JPMorgan Chase is recommending shareholders vote against a proposal calling for the bank to stop investing in companies that "substantially contribute to genocide or crimes against humanity." Specifically, the proposal points to JPMorgan's big stake in Chinese oil giant PetroChina (PTR), the publicly-traded arm of China National Petroleum Company, which has been widely recognized and condemned for helping finance genocide in Sudan. According to a filing with the Hong Kong Stock Exchange last month, JPMorgan (JPM, Fortune 500) owns nearly 1.3 billion Hong Kong-listed shares of PetroChina worth almost $1.8 billion, making it PetroChina's largest U.S.-based shareholder. Though JPMorgan's investment in PetroChina is legal, citizen-led nonprofit Investors Against Genocide says it "works against the spirit" of the U.S. government's economic sanctions on Sudan. In its urge to reject the proposal, JPMorgan's board said its business practices already "reflect our support and respect for the protection of fundamental human rights and the prevention of crimes against humanity" and noted that "a vast majority" of the shares of PetroChina owned by JPMorgan are "at the direction of our customers, who are the share owners." Investors Against Genocide argues that JPMorgan's unwillingness to establish a policy forcing it to avoid investing in companies that are tied to genocide when it invests on its own behalf is a problem, no matter how small the stake may be. The proposal also points out that a big chunk of PetroChina holdings is tied to JPMorgan's wealth management business. While customers are involved in choosing an appropriate asset allocation strategy, they are rarely involved in picking individual securities, said Eric Cohen, co-founder and chairman of Investors Against Genocide. That means those investors are "inadvertently investing in these terrible companies that are helping to fund genocide and have no idea," said Cohen. Last year, Investors Against Genocide's proposal attracted less than 8% of JPMorgan shareholders' votes of support. This year, the group is campaigning hard, although the outcome of the votes won't be revealed until JPMorgan's shareholder meeting next Tuesday. Shareholders vote for or against proposals included in the annual proxy in the days leading up to the shareholder meeting. The proposal was sponsored by Investors Against Genocide co-founder and director of strategic initiatives William Rosenfeld. The Securities and Exchange Commission requires shareholders to own at least $2,000 in company stock for one year to be eligible to file a shareholder proposal. Representatives from Investors Against Genocide attended the Council of Institutional Investors' spring meeting last month in Washington, D.C., to meet with managers of some of the nation's largest pension funds and endowments, including Pat Doherty, the director of corporate governance for the $140 billion New York State Common Retirement Fund. "The discussion was very informative," said Doherty, adding that the pension fund is voting in favor of the proposal as a result. 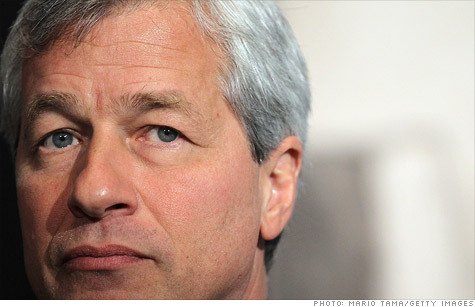 The New York State Common Retirement Fund has a $604.2 million stake in JPMorgan, making it among its top 10 holdings. Voting for the proposal is an extension of an existing policy that prohibits the state's pension fund from investing in companies doing business in Sudan or Iran, including PetroChina. Similarly, Florida's pension fund, which holds $292 million worth of JPMorgan shares, has also voted in favor of the proposal with adherence to the state's legislation that forbids investment in companies involved in Sudan or Iran, said Michael McCauley, senior officer of investment programs and governance at the Florida State Board of Administration. Investors Against Genocide is also hopeful that investors who voted in favor of the proposal last year will show their support again, including T. Rowe Price, JPMorgan's sixth-largest shareholder, which holds more than 2% of the bank's outstanding shares worth about $3.3 billion. T. Rowe Price (TROW) completed selling all of its shares of PetroChina in 2008 because it posed "high risk due to their ties to the Sudanese government and its connection to human rights abuses." The Baltimore-based mutual fund giant still maintains a policy that excludes those companies from consideration for investment. "We are picking up more support this year," said Cohen of Investors Against Genocide. "What it will amount to, we don't know, but it won't be for lack of trying. We'll continue to submit proposals to JPMorgan until we are successful in getting them to establish a policy." Regardless of the ultimate fate of this year's proposal, Doherty said growing support for it "sends a message of significant shareholder concern, which can certainly push companies to make a change." In 2010, American Funds divested its $190 million investment from PetroChina following pressure from Investors Against Genocide and shareholder proposals advocating "genocide-free investing." In addition to JPMorgan, Investors Against Genocide is also pushing other investment firms to divest from companies that have ties to the Sudanese government, and in turn, the Darfur genocide. The group plans to submit a shareholder proposal to Franklin Resources (BEN, Fortune 500), the holding company for Franklin Templeton Investments, at its next shareholder meeting. Franklin is PetroChina's second-largest U.S.-based shareholder in the company, just behind JPMorgan. "The conditions in the Darfur region of Sudan are deplorable, and we support efforts toward positive and meaningful reform there," Franklin Templeton Investment says in a statement posted on its website, declining further comment. However, the firm also noted that there is considerable debate about whether divestment will "prove effective" in changing those conditions.